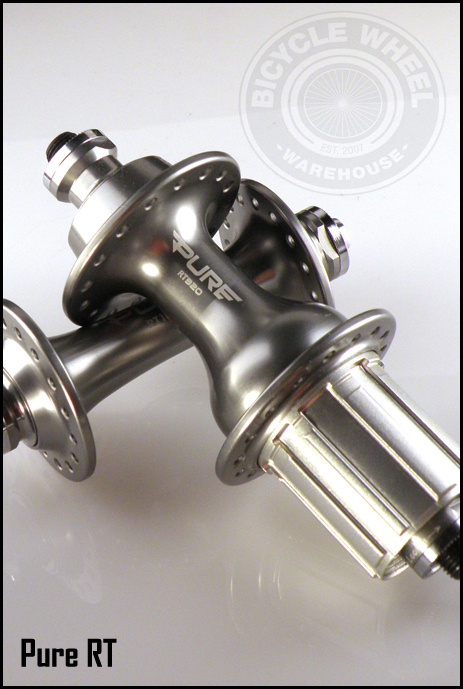 The sealed bearing front Pure RT100 hub is very light, at 100g. This weight is accurate, not favorably rounded down a few grams to make a nice even number. But that's just a number. The reality is that these are very durable hubs, employing the use of high quality sealed cartridge bearings that fit precisely into an aluminum hub shell. The flanges are notably thick, with slightly recessed and chamfered spoke holes. In sum, this is a top quality front hub. The Pure R320 rear cassette hub balances performance and capability. At 325g, this hub is very light, but it still employs a steel axle and freehub for ultimate durability. Whether you’re touring, camping, hauling gear, or just riding tons of miles, these hubs are up for the task. The hub flanges are extra thick, with spoke holes that are slightly recessed so that the flange helps support the spoke elbow. The cassette free hub body engages via a double 3 point pawl mechanism, (compared to the standard 2 or 3), which creates a fast, secure feel every time torque is applied through the pedals. The rear free hub body is easy enough to remove, in case you want to clean and regrease the internals, and offers Campy compatibility with the separate purchase of a Campy free hub. The steel freehub resists cassette bite, so swapping cassettes is a breeze. We love these hubs, as they have proven to be a very low maintenance, highly reliable, light weight alternative to many other more expensive high end options in the marketplace. *Includes a light weight alloy front and rear Pure QR lever.